Depending on your company's holiday policy, you may wish to include public holidays in the amount of time off that people can book. 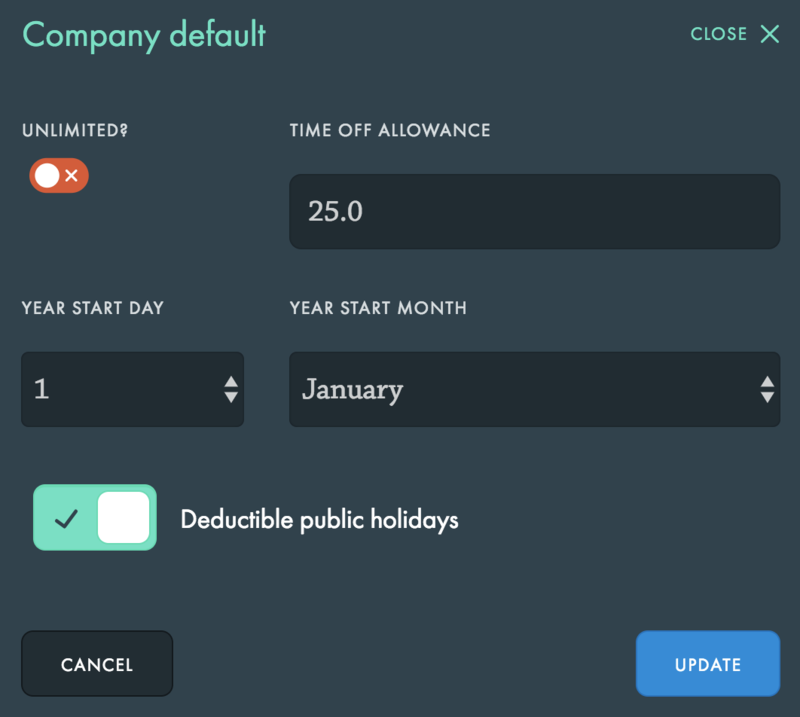 If your company policy is to include public holidays in the amount of time people can book off, here's how you can set that up in Charlie. This is also the best way to ensure that part-time team members get a fair amount of time off, including the right amount of public holidays. By default, Charlie does not deduct public holidays from people's individual time off allowance. To change this, go to Settings > Time Off, and choosing "Edit" next to the Default Company Allowance heading. Set the "Deductible public holidays" switch to the on position and confirm that you wish to save this setting. Please note: this will change the number of time off days approved for everyone at your company! At this point, you may want to adjust the default company allowance, eg. increasing from 20 to 28, to reflect that this includes public holidays. By default, Charlie does not deduct public holidays from people's individual time off allowance. This can be simpler to manage for companies without part-time team members. These public holidays don't count towards their "days used" in Charlie. 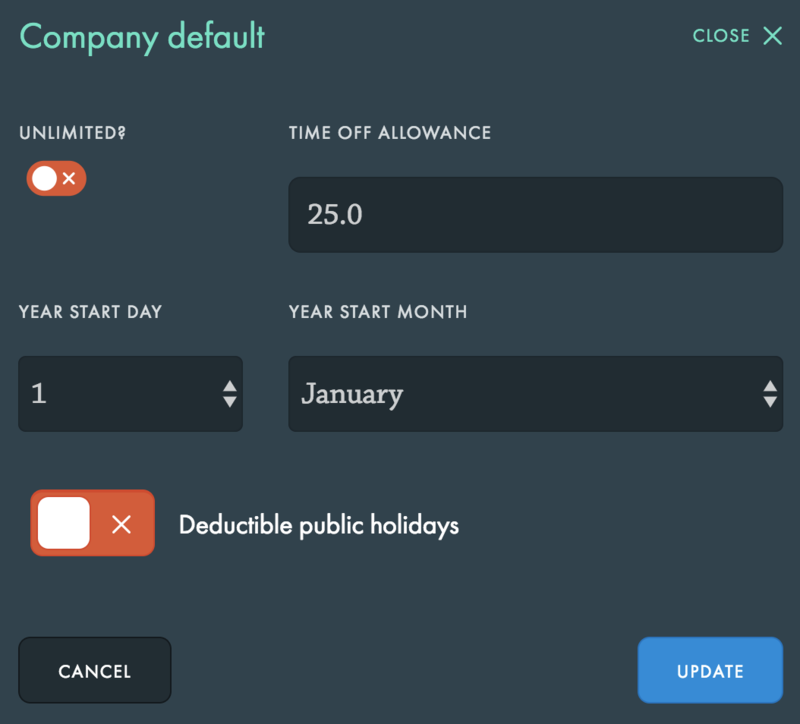 If you've changed your time off settings and want to go back to excluding public holidays, you can change this by going to Settings > Time Off, and choosing "Edit" next to the Default Company Allowance heading. Set the "Deductible public holidays" switch to the off position and confirm that you wish to save this setting. Please note: this will change the number of time off days approved for everyone at your company! Each of your offices can have its own set of public or national holidays, which will be included or excluded from team members' allowances based on your company setting. Alternatively, you can turn public holidays off completely for an office, which stops them from displaying or being factored into people's time off calculations.